I got a bit behind with the English posts as the trip I’m going to write about today happened between January and February but for some reason I didn’t felt for writing anything for last couple of weeks. However, because of my work I did not had a time yet to do much travelling around to discover Canada but I needed to take my holidays and I found a colleague who would like to join me for a short trip to Quebec (the French speaking state). On our way there we took a road around the coast of New Brunswick and I can say during a winter months there is probably not that much to see and to the more interesting part we got after sunset and now I cannot say if it will be better there. Anyway during our way up I was surprised how much people live there and it keeps me wondering what could they do there for a living because I did not seen many farms or other things they could do there and by looking to the map there was nothing really close to those places. Our first night we arrived to the Quebec City were we found good hotel for a great price on Priceline where you can find some great deals for a bigger cities around the world (my friend told me they were bought by Booking.com so it might change later but now it’s pretty good page to find last minute deals for accommodation). It was really late when we get there and we spent most of the time on the road so we went to bed with good weather forecast for the following day. Originally I thought we won’t arrive the first day to the city and we would spent a some time in those mountains but I was the only one who wanted that so I will have to wait until the spring or summer. Overall there are not that many people which would spend a time outside in the wither around here if I don’t count those with dogs. 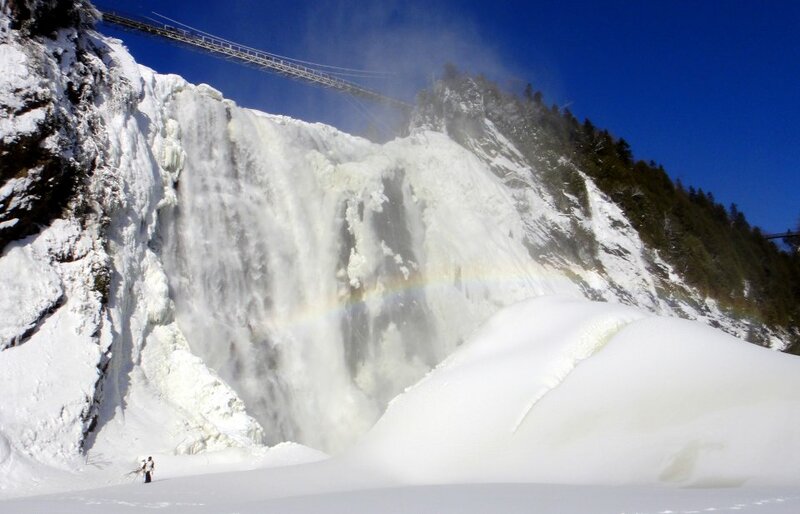 In the morning we agreed to visit the Montmercy Waterfall which is on the following picture and it’s a bit higher then Niagara Falls in Ontario and this winter was nicely frozen so we could see it from the very bottom where you cannot stand in other seasons. From here it was really close to Ile d’Orleans, it kept a lot of it’s agricultural functions so I think it will be much better there during a summer or fall. We made it around the island and had a nice lunch and we tried to visit a lookout as well but that one was locked so probably we would need to return another time. Then from here we went to ski resort at Mont-Sainte-Anne which remind me those we have in the Czech Republic also but my friend like it a lot and for him it was a new experience. 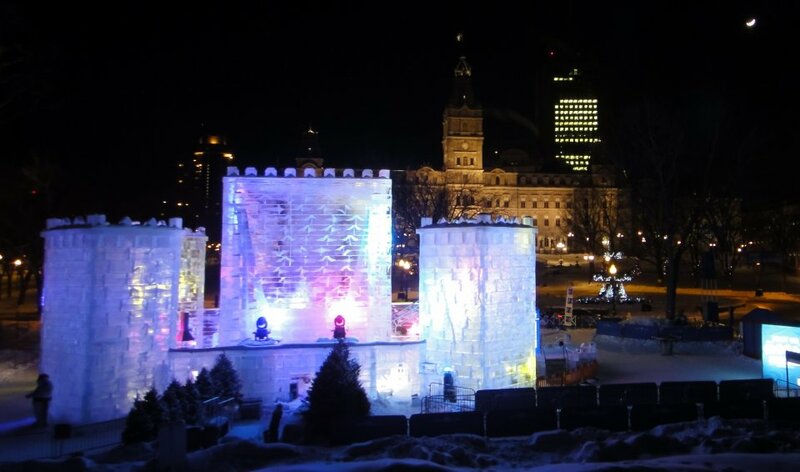 Than we get to the Old Quebec City for some sightseeing and because there was just starting the Ice Festival we could see also an ice castle like this. The Quebec City is the only fortified city north from Mexico City so it reminds a bit more European cities and because of that it is unique here in Canada and United States. Also everything here is only in French but we didn’t had any problems to get around or talk with people in English. The next day we decided to visit Montreal where we went to Olympic Park and Bio-dome and then took a walk through the city after sunset. I got there mine first ticket for bad parking because I parked a car to close to fire hydrant without know that it’s forbidden so I took this expensive lesson on that day. In the morning we went around a city and had a great crapes which took me back for a while to Corsica and later set off to drive back to see the Quebec City after sunset as well. I still like cities with all those light more then during a daylight and Quebec is really stunning during a night. That night we spent in motel several hundred kilometers away from Quebec. On our way back we stop to see the world longest covered bridge in Hartland. I observed here the same thing I already saw in Australia that there are many little villages and communities which tries to get somehow tourist to stop there by having something great like this bridge or the biggest axe or violin or the biggest lobster we had seen on our way to Quebec. Also later I bought a bicycle so I can use it on my way to work and around which I missed a lot but winter still does not want to give up the fight.